Turn This "IPL 2019" into a Goldmine with an App like "Dream 11"
INDIA! INDIA! Get ready to cheer more! Cricket season is on its way, and we all are ready to hear & cheer INDIA once again in the coming world cup 2019, even we all have already started cheering for our favorite cricket players in IPL 2019. Don’t you? A few years back we were used to sitting and to cheering for our favorite players and Team INDIA, but do you know, now we can be a millionaire by watching, playing and earning on an App like Dream 11? Time to grab the opportunity by making this IPL 2019 & World Cup 2019 a Goldmine with an App like Dream 11. We all know about the leading fantasy sports platform Dream 11. Sports enthusiasts and childhood friends Harsh Jain and Bhavit Sheth started fantasy sports platform Dream11 nearly a decade ago on a mere hunch that sports fantasy leagues would be big business one day. Today, after putting to bed a legal dispute and many other challenges, the company is the market leader in the Indian online fantasy gaming space. Sports app platform like Dream 11 is all about passion, fun, excitement, anticipation and most importantly rewards in term of bonus and cash prizes a sports lover can achieve. Starting a business with the App like this can open the door of success and revenue. Something that led us to write this article is a question from rising startups is- How to develop & how does it cost to develop a sports fantasy app like Dream 11? There is no need to introduce that how much Sports App market is flourishing, as we can see the fire in people of supporting their favorite team or players. Mobile apps are playing a far better role as people could leverage the feast of cricket at their workplace, home, in traveling, etc. Have A Peek On How Big Dream 11 Is & The Potential It Comes with. Harsh Jain and Bhavit Sheth started fantasy app in 2008, and in 2012, they introduced freemium fantasy sports for Indian cricket fans. In 2014, the company reported 1 million registered users, which grew to 2 million in just 2 years later- 2016 and to 45 million in 2018. Now, Dream 11 is India’s biggest sports gaming app, which has crossed 50 million registered users, which is the highest score for any sports gaming platform in India. Much the same as some other online startup, fantasy sports game platforms work dependent on a phenomenal business model. Fantasy sports business models are explicitly designed and developed around genuine sports, players and their fans. This gives sports fans the chance to include fantasy sport going on alongside genuine sports games effectively. Dream11 is no special case yet takes a shot at a similar idea. Presently we should discuss what the business model of Dream 11 is and how it functions. A user can enter Dream11 referral coupon code that is received from other users at the time of signing up and can earn certain signup bonus money too. At the second end, the referrer also gets the same bonus amount. For each and every match, the user gets a chance to make his/her very own dream group of 11 players(that’s the reason they named it Dream11) of their decision from candidate team with certain games standards of what number of players you can choose from each team and type(bowler, batsman, all-rounder). A user gets a specific budget (100 credits) while making another fantasy team and can be spent that budget by including a player of his/her decision. Every player costs certain credits, so that is the place the user needs to remain inside a given budget by choosing the best players in a group. When users settle his/her fantasy team by choosing a captain and vice-captain of a team, it’s an ideal opportunity to join the available contest by paying specific entry fees, and this is the hot spot from where App like Dream11 wins a large portion of its revenue. Every one of this contest has a specific winning sum and a limitation on what number of teams can join. Likewise, to set up a fantasy team, the user gets a specific deadline before which each interested user must prepare(and additionally edit) a team and join somewhere around one contest to turn out to be a piece of this dream. Based on a contest and number of the team joined platform chooses absolute what number of teams will turn into the champ and what winning sums will be appropriated based on their rank positions. Just before a real sports event happens; platform announces lock-in period. No new team enlistments and changes in the team are permitted amid this lock-in period. And with the start of real sport real thrill of fantasy sport begins. As per the popularity of the Dream 11, considering millions of the cricket teams playing on every single day on Dream 11, it is complex to predict the exact revenue being earned by Dream 11 every day. Based on the team, winning amount, contest-winning prize, it is possible to detect lump sum revenue. 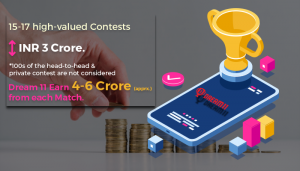 According to the rules of Dream 11, every day Dream 11 launches 15-17 high-valued contests with a total winning amount ranging from INR 3 crore. Other 100s of the head-to-head and private contest are not considered in this list. Putting all the calculation together approx revenue of Dream 11 is around 4-6 crore from each match. Keeping the considerable revenue most of the startups are thinking to perform mobile app development like Dream 11. If you might want to turn out to be a piece of this fastest developing business world of fantasy sports or need to begin mobile app development for developing your own Dream 11 like the app, here are some highlights that you have to take care to become next Dream11 holder in your nation. Discover which sports are well known in your country, which sport is expanding prominence and if you as of now have a rivalry in it for sure. These 3 are integral components of whether you need to seek after this business opportunity or not. You have to plan your business before you begin the unwritten rule and takes no advanced learning to get it. Plan your sports specialty, your audience, your budget plan, your team, list of features and your deadlines. Choose whether you need to offer a web interface just or a mobile interface only or the two interfaces to your user to get drawn in with your platform. It is fitting to concentrate on a mobile interface intensely, as there are more mobile users on the planet than desktop users. Anyway, a combination of pleasantly planned web and mobile interface would be leeway for your business. Get drawn in with experienced web and mobile app development companies for development of your engagement model. You are the supervisor of your own business. You can choose the format and games rules of your business. Ensure you keep your gathering of people drawing in with your dream sports games alongside fervor of real sports. Dream11 presents a wide scope of game format that user can participate in, including a free contest, practice contest, featured contest, season special contest like IPL with winning sum coming to up to INR.5,00,000 (US$7,500). Cricket as well as fantasy sports alliance business model can be connected to any game of your decision. Football, NBA, Tennis, Baseball, American Football…you name it. If you are not promoting, trust me you are not selling. Without promotions or marketing, you cannot make the people aware of your existence even that you are the best in industry. Execute different on the online and offline marketing strategies like events, exhibitions, print media, electronic media, radio, social media, and mobile marketing are not many of the ideal approaches to get took note. Dream 11 like app will be no less than an excellent opportunity to dive in the world of earning more and more. 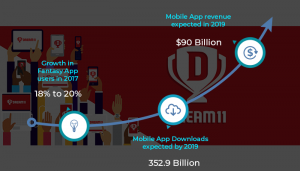 Investing in developing an app like Dream 11 would be surely become a chartbuster way to earn. So let’s have a talk regarding app development cost at sales@ripenapps.com. Fantasy sports is a productive market, and it is becoming an upward trend in India with the success of Dream 11. 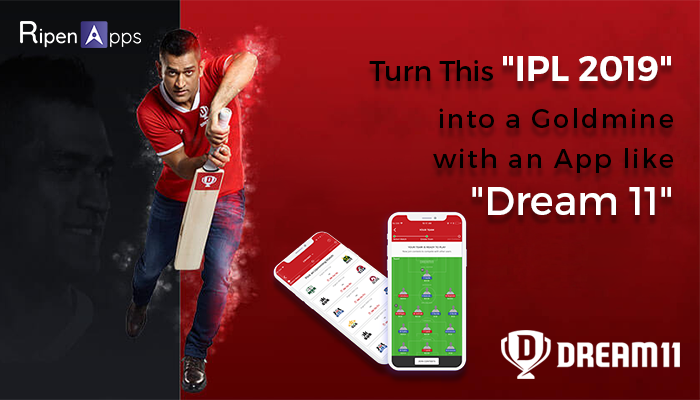 You can become next Dream 11 holder in India if you successfully play all strokes including- analyzing true market opportunities for fantasy sport, develop stable, reliable web & mobile app platform, Introduce real user experience to your users, Market your fantasy sports platform consistently.